The first time I visited Pikes Peak, I had no intention of doing anything other than hiking and enjoying the scenery with my husband. Little did I know that I would have two experiences that changed how I feel about the world around me, both of which culminated with a feeling of awe and perspective that I greatly needed. 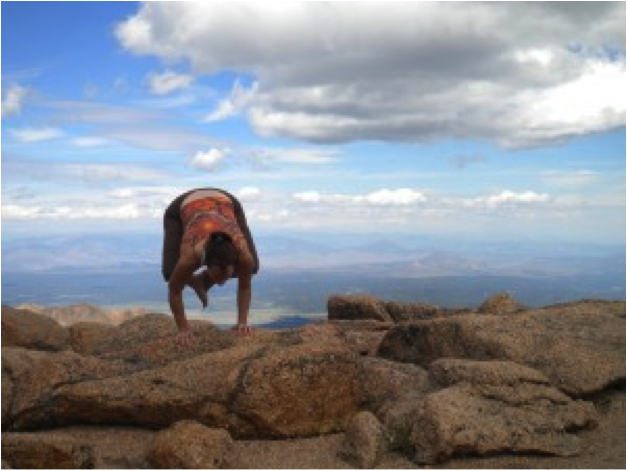 On top of Pikes Peak, the view was indeed breathtaking…and, being the yogini that I am, I wanted to capture the view with photos that included some of my asana practice (combining two of the things I love most: nature and yoga!). After I instructed my husband on proper angles and imagined the best fusion of asana and nature for the photos, my practice started to naturally flow…my inclination was to do “grounding” poses (perhaps to balance the altitude?). They felt great, and I felt my body “relax into” itself as I practiced triangle, side angle, pyramid, and of course, mountain pose (duh…how could I leave that one out?!)! As I took in the views, felt my lungs fill with air (as best I could, given the altitude! ), and stopped to feel what my body was feeling, I felt overwhelmed with a sense of being small. Here was this GORGEOUS view all around me, from a mountaintop on which I stood…and I felt humbled…small…like all of my little problems are just a speck in the scheme of life. I imagined this is what a “birds-eye view” of the world must be like. Almost as soon as I had that shift in perspective, I noticed that a small crowd had begun to gather on a nearby ridge, just far back enough so as not to disturb me, but obviously watching me practice. I am embarrassed to say that my ego took over almost instantly, and I thought of “impressive” asanas I could do to “entertain” this crowd! Balance asanas are a particularly favorite category for me (when I’m focused that is…otherwise, they’re my nemesis! ), so, amidst the “ooh’s” and “aah’s” of the crowd, I began a sequence of dancer, standing big-toe, tree, and crow (oh boy, did I regret that choice!). After several attempts at this arm balance (challenging on an even surface, let alone on a boulder! ), I “got” the pose…and then lost my balance, only to slide down the mountain several yards before I could catch myself and stop. While I wasn’t injured, but for some scrapes and bruises, I realized that my ego could have quite literally killed me! In short, the point of my telling this story is that sometimes we feel that we are “in our heads” to the point that we need a good reality check (perhaps not falling down a mountain, but something more subtle!). It is during these moments that we need grounding…in order to help us gain perspective in what might become troublesome situations. Grounding can be as simple as visualizing your feet quite literally “rooted” into the earth. You can use your breath to feel grounded. Expand the belly and chest as you inhale (feeling it rise upward), and send the breath back down as you exhale. If you are experienced in yoga and meditation, there are plenty of grounding asanas and relaxation techniques to help foster the feeling of being grounded. If you would like guidance, feel free to contact me. Join me on the FYB Facebook page by clicking “like” (on the right side of this page), or CLICK HERE to set up a time for us to chat. Besides talking yoga and meditation, we can talk about how I can help you get the breakthrough you deserve! Show your stress who’s boss! =======> Let’s get started today. Learn more about how I can help you improve virtually every area of your life, as I have for so many others. CHECK OUT OUR TESTIMONIALS (including some names you might recognize! ).